A Harrowing Tale | Spaceship! Spaceship! Spaceship! spaceshipspaceshipspaceship.net: The Harrower Star Destroyer is quite an obscure vehicle in the Star Wars expanded universe, so what led you to build it? 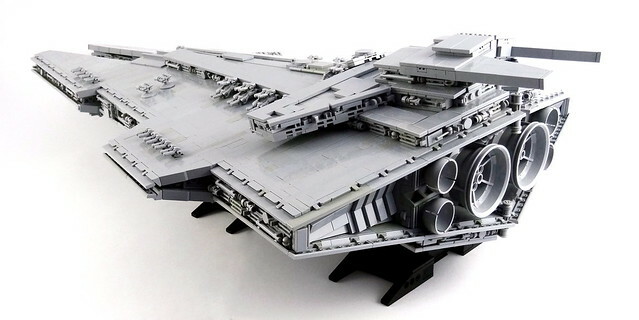 Why not just build a regular star destroyer? Koen: Seeing Jerac’s magnificent star destroyer on Flickr got me enthusiastic for making my own star destroyer type ship. 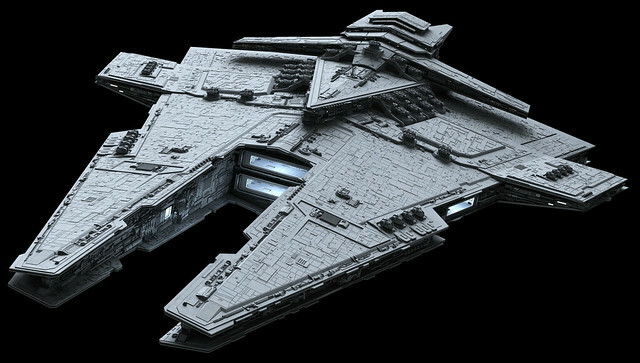 I wanted to build a Harrower class ship from the MMO Star Wars The Old Republic which I have played for years, because I personally think the shaping of this ship is cooler and more threatening. SSS: How did you decide the scale of the model before you began building? Koen: Hmmm, well… the ship basically had to fit on the only empty space I had left in my room which was the top of my bookcase. SSS: Did you use LDD / Ldraw etc or work in-the-brick? Koen: I combined digital building (using LDD) and real building and went back and forth continuously. Building with real bricks allowed me to test techniques and sturdiness and using LDD was a great way to save the design and make small improvements on what I had built. I don’t actually have one file with the total ship… instead it exists in six files each containing a section – main frame, wing frame, upper wing, lower wing, bottom, top. SSS: In your first Flickr WIP you said “After a couple of months designing it’s time to build the ship completely” so what was that design process before building? 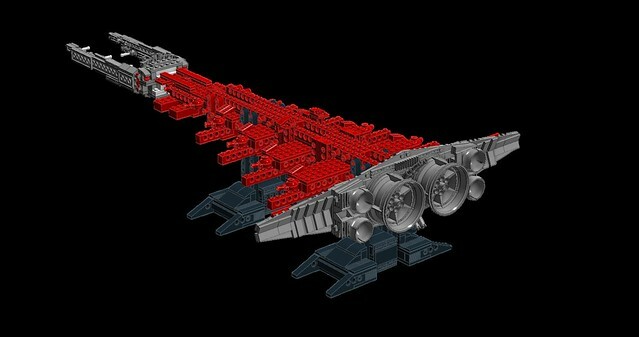 Koen: When I decided to build the Harrower I started looking for pictures of the ship. From there I constructed an outline build from plates to get the basic shape. After that came building the frame, the wings, the bottom, the engines, the front and the top. It took some time to figure out how to make the angles both horizontally and vertically. However the most challenging part was how to build the bottom and top: this is where all the angles meet and I remember it took me 2 months before I found a solution to achieve a sturdy seamless build. During these months I went back and forth from building digitally and building for real to continuously improve the design. It was a very colourful build too, since I just used the parts I already had at home. When the design was finished it was time to buy a lot of gray parts to build the final version. The final ship was build from scratch within 5 days using the design I saved in LDD. SSS: The extraordinary thing about this model is just how flawless and seamless it is. There’s no ugly gaps, everything seems to fit together perfectly. Was that a goal at the start of building or did you just polish it until the gaps all went away? If not, how did you commence the design process so that you’d be able to use existing parts to flawlessly complete it? Koen: I wanted a realistic look for the Harrower; so, yeah, this meant there should be as few gaps as possible. To prevent gaps it was important to get the angles right. For example the angle of the ship lengthwise matches quite well with slope with angle 75. This made building the front easier. And the angle in the height matches pretty well with wedge plate 12×3. It was pure luck – the angles I measured from side and top views of pictures of the Harrower matched the angles of these parts. For the bottom and top I used brackets, panels and tiles to make seamless transitions where the angles meet. SSS: How strong is it? Will it survive being dropped? SSS:Thanks to Koen for taking the time to answer my questions and supply some pictures. Click the links below to check out more fantastic pictures of this incredible build!